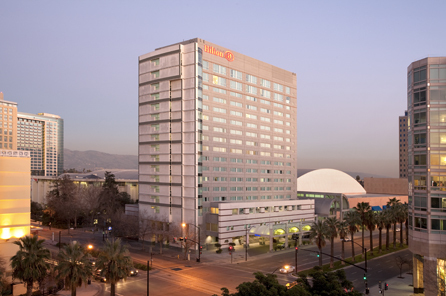 The 2017 EHA conference hotel is the Hilton San Jose in the downtown area, 3 miles from the airport. It is a modern hotel that features a pool, jacuzzi, and a fitness center, with easy access to lots of restaurants and downtown entertainment. The deadline for receiving the group rate is August 22, 2017. Note: Hotel space is always at a premium at the EHA meetings, so please reserve your room early to ensure availability. You can call in number for booking reservations for the Marriott by phone: 1-800-228-9290 (caller will need to indicate they are a part of the Economic History Association 2017 Annual Conference). You can also park at the Convention Center for $20 max/overnight. This is cheaper in comparison to our valet – $37/day. http://www3.hilton.com/en/hotels/california/hilton-san-jose-SJCSHHF/maps-directions/index.html. A bus is $9, and a taxi $20 (Uber or Lyft would be half that). The drive time is 5 minutes. The closest airport is the San Jose International Airport: http://www.flysanjose.com/. You can find ground transportation options on their website too. You can also fly into San Francisco Airport. It is approximately 45 minutes away by vehicle. You can find some ground transportation options here: https://www.flysfo.com/to-from/ground-transportation. Or you can use public transit from the airport (first BART, then Caltrain): https://www.flysfo.com/to-from/public-transit. Please note that the EHA does not endorse any of these options in particular—we urge you to look for them online and decide for yourself. Parking at the hotel is $25 for self-parking, and $35 for valet parking. Book early to secure your preferred travel option!